Passiflora. This superlative genus offers more than 500 species, most native to tropical America. Maypop, P. incarnata, is a well-known exception, found growing wild in the Southeast U.S along with a few other species. Every aspect of these vines will knock your socks off, from their Daliesque flowers to their singular fruit. Plant a passion vine and head for cover before you are lost in an evocation of its steamy, lush jungle origin. To 20 feet or more in one season under optimal conditions, with flowering spring through fall. We have Darwin to thank for discovering that the beak of the Panama hummingbird adapted itself to fertilize the flowers of Passiflora racemosa, as depicted in the above painting. Requires regular water and food for best performance. Full sun. Watch for nematodes in soils that harbor them. Butterflies love certain species but who doesn't love butterflies? Some species self-protect by producing nodal growths that mimic butterfly eggs. Fruit set can be enhanced indoors by brushing pollen among flowers. Fruit drops, wrinkles and ripens over a few weeks before it's ready to enjoy. Self-fertile, evergreen. Vines will go dormant and drop leaves during cold spells. Prune hard in early spring. Zone 10, Zone 9 with protection. Passiflora edulis 'Red Rover' sends gardeners on over for its typical edulis flowers followed by large maroon fruit and handsome deep green foliage. Vigorous yet compact, 'Red Rover' is a choice landscape specimen as well as a fine contributor to the kitchen fruit basket. Grown in 5 gal containers, vines are semi-dormant as of February 2019 and have lost many of their leaves. WILL BE AVAILABLE LATE SPRING 2019. Passiflora edulis 'Black Knight' has crinkled, bright green leaves and produces intricate white blossoms followed by black egg-shaped fruit filled with tasty pulp. Another Patrick Worley hybrid, this selection offers compact growth for the species, which translates to a superlative container growing experience. 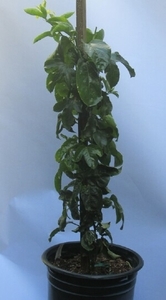 Grown in 1 gal containers, about 2' tall, semi-dormant as of March 2018. OUT OF STOCK. Passiflora edulis 'Black Knight' in 5 gal containers. As of May 2017 these passion vines are well-established, with numerous branching from the crown to 4'. OUT OF STOCK. Passiflora edulis 'Frederick' is yet another offspring of Patrick Worley wizardry. With fragrant white flowers and goose egg fruit filled with ambrosia, this vine is a treasure in suitable climates where temperatures stay above 30 degrees F. Like most passion vines, let the fruit drop then wrinkle before savoring. Grown in 1 gal containers, plants are about 3' tall, very full as of July 2018. OUT OF STOCK UNTIL LATE SPRING 2019. Passiflora vitifolia.. Named for the resemblance of its leaves to grape vines. Also known as the fragrant passion vine, this vigorous grower to 20' produces true red flowers spring through fall that are followed by fragrant fruit that can take up to a month to ripen after dropping off the vine. Frost sensitive. Plants are grown in 1 gal containers. OUT OF STOCK. Passiflora edulis 'Nancy Garrison' hails from a found passion vine in front of an old farm house in San Jose. Its provenance explains its superior performance in northern California, where it can withstand a few degrees of frost better than other edible cultivars. Fruit has a distinctive pineapple flavor, same remarkable flower. Grown in 5 gal containers, plants as of April 2019 are 3' tall, still partly deciduous, new growth just beginning. OUT OF STOCK.